The best real estate is found in Miami Beach because these properties feel like private resorts, not just homes. Real estate in Miami Beach has a large price tag and that’s because it’s in a prime location with waterfrontage, backyard amenities like a swimming pool, patio, and entertainment space, and high-end interior amenities to complete the resort experience. These homes are highlights of Miami Beach real estate and showcase all that the area has to offer. 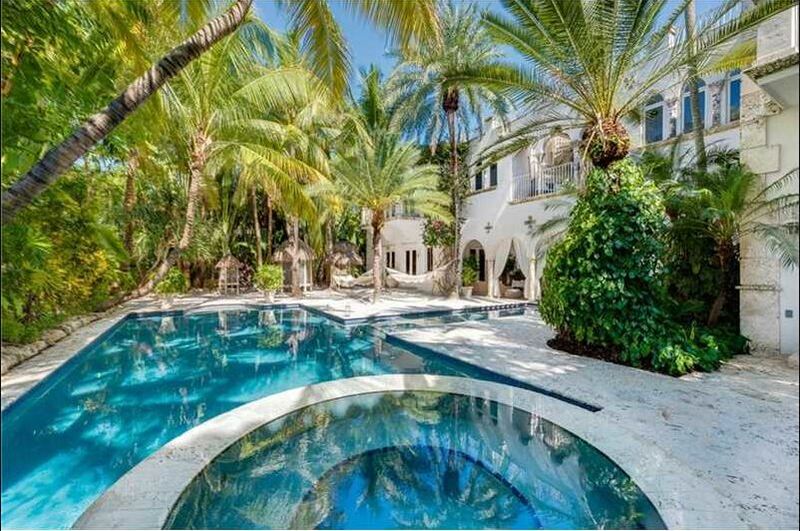 This Mediterranean estate is one of the prime listings in the Miami Beach real estate market. The home was once owned by Lenny Kravitz which draws interest beyond the property itself. With six beds and and seven baths covering 11,000 square feet, the size alone makes this property a private resort. There’s enough room to accommodate guests or families of a variety of sizes. Interior amenities include a gym, elevator, and movie theater while outdoor amenities range from a meditation garden to a private beach. The pool has very tropical vibe with privacy hedges creating a secluded getaway. The patio space has hammocks which round out the salt water pool experience. There is a private boat dock and an amazing view of the water. This home is luxurious through and through, definitely showcasing the amazing real estate in Miami Beach and what it’s like to have a residence that feels like a private resort. Real estate in Miami Beach also includes some more modern resorts, properties that deliver the full package that is luxurious Miami Beach living. This 15,000 square foot property is located on a very high-end street which has amazing views and plenty of privacy. The home itself has seven bedrooms and nine baths, perfect for any range of lifestyles. There is sliding glass throughout which merges the exterior and interior spaces as well as invites the lush views inside and offers plenty of natural light. On the waterfront there’s a large dock and neighboring outdoor kitchen, which is great for entertaining or spending the day out of the house. The pool is very modern in design with the home flanking both sides, further incorporating the indoor and outdoor spaces. This home is a great example of modern and minimal architecture in the Miami Beach real estate market. As a modern resort this home delivers in all areas from amazing waterfrontage to high end technology and a sophisticated aesthetic.